"I alone have seen it, and that is why no other face bears such hideous lines of fear as mine. When I came upon it in the still ghastly stillness of unending sleep it looked at me, chilly from the rays of a cold moon amidst the desert’s heat. And as I returned its look I forgot my triumph at finding it, and stopped still with my camel to wait for the dawn." We may think we know the history of our world, but there are secrets that could undo our understanding of the universe. Hidden deep in the rainforests of southern Mexico, one such truth has the power to unravel the fabric of time itself. Now, your team of brave investigators must leave the safety of civilization behind and set out on a scientific expedition to make the discovery of a lifetime… but the perils you face may prove to be your undoing. 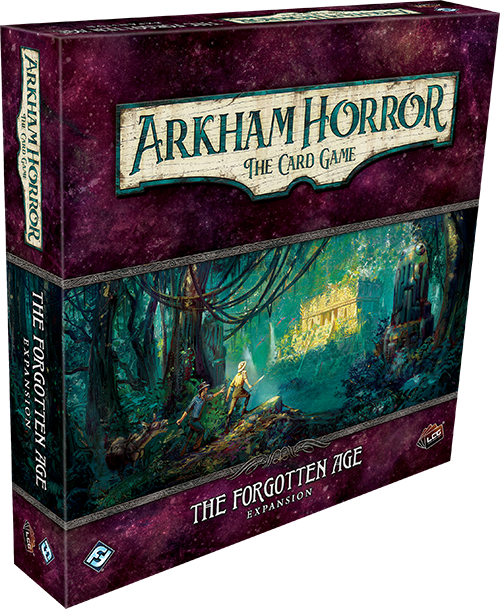 The Forgotten Age deluxe expansion for Arkham Horror: The Card Game is now available at your local retailer or online through our website! 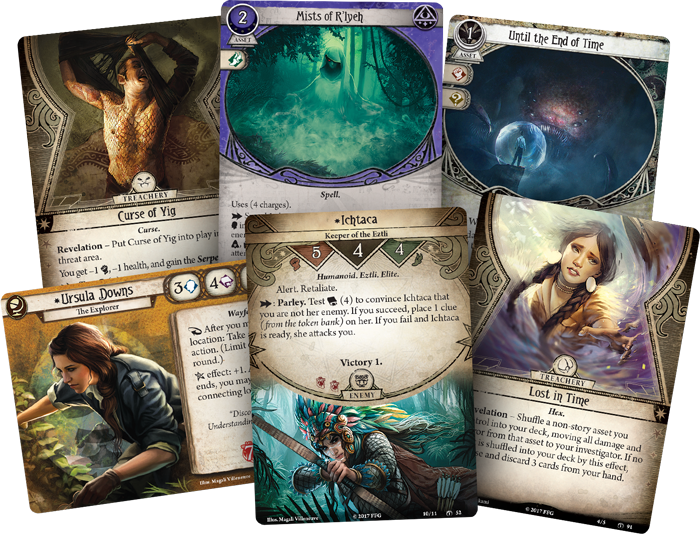 The third deluxe expansion for Arkham Horror: The Card Game, The Forgotten Age takes you deep into the jungle, where your expedition team searches for the ruins of a lost Aztec city-state. Hundreds of miles away from the outside world, you desperately search for the remains of a civilization that may not even exist. 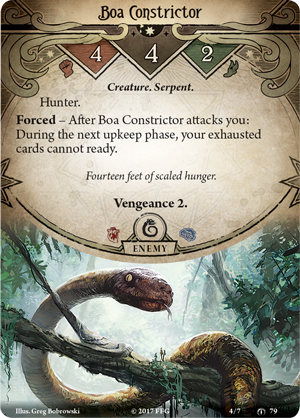 The danger grows with each step you take—beyond the treacherous creatures that reside here, like the powerful Boa Constrictor (The Forgotten Age, 79), you feel almost as if the jungle itself does not want you here. You must explore (as featured in our announcement article), manage your supplies, and keep watch for the dangers lurking in every shadow in order to reach your destination. Over the course of The Forgotten Age campaign, you will face harrowing dangers and encounter new treacheries unlike anything you’ve experienced in Arkham. This expansion contains two new basic weaknesses that only feature in campaign mode, and they'll change their shape and grow in dark power as you progress throughout the campaign. For example, you may become trapped in a terrible time loop with no way out once you make a Dark Pact (The Forgotten Age, 38). 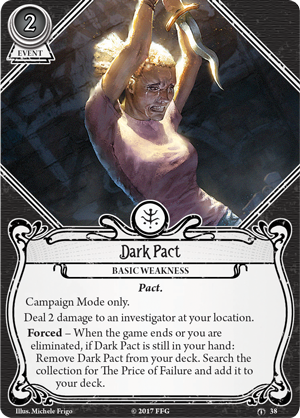 This weakness acts like a normal event; you can choose to hold it in your hand, or pay two resources to play it and deal two damage to an investigator at your location. 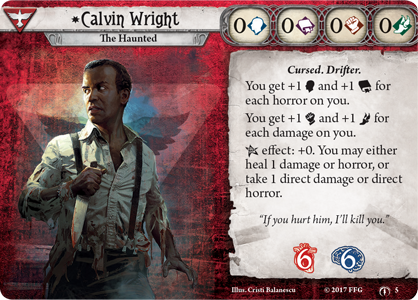 For an investigator like Calvin Wright (The Forgotten Age, 5), who you can learn more about here, this curse may prove a blessing, but for others, why would you ever choose to play this event? 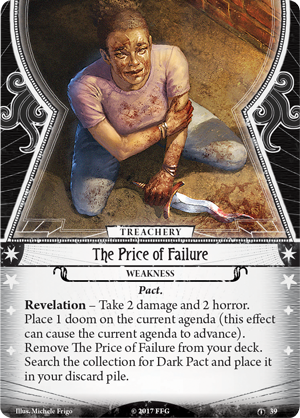 The answer is that if you are eliminated or the game ends while Dark Pact is still in your hand, you must remove the card from your deck and replace it with the set-aside The Price of Failure (The Forgotten Age, 39). Whenever this weakness is revealed, you must take two damage, two horror, and place one doom on the current agenda, possibly causing it to advance. Luckily, this effect will only happen once before you switch the card back with the Dark Pact. Perhaps, the next time, you will be more willing to pay the blood price that your dark deal demands. In addition to the first two chapters of The Forgotten Age cycle, this deluxe expansion provides you with sixty-four player cards to customize your investigators’ decks and prepare them for the trials to come. You may sling a trusty Survival Knife (The Forgotten Age, 17) on your belt, ready to confront any obstacles that may cross your path. Still, hopelessly surrounded by the watching eyes of the rainforest, it may be wise to recite a Protective Incantation (The Forgotten Age, 31) and seal any chaos token other than the automatic fail token, making your trek that much safer. 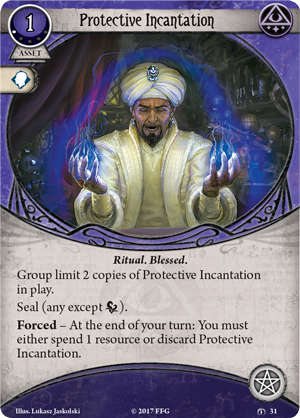 However, this spell requires energy to maintain, and at the end of your turn, you must either spend a resource to maintain the protective seal on the token or discard the Ritual. If you embark on your expedition without proper funding, you may quickly fall victim to the whims of the chaos bag once more. If you are truly in dire straits, you may find yourself down to your Last Chance (The Forgotten Age, 36). With a stunning five wild icons, this skill card is at its most powerful when you have no other cards in your hand. You may wish to keep this in reserve until the last possible moment, but is the reward worth being lost in the wilds? 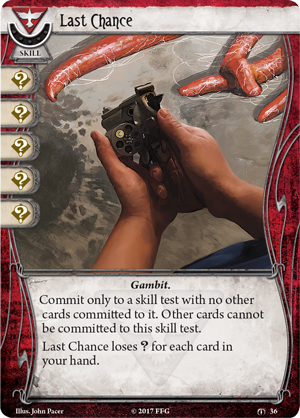 Will a single shot be enough to save you, or will your name on the expedition roster prove to be your death warrant? The expedition is ready to set out. Do you have the courage to join? 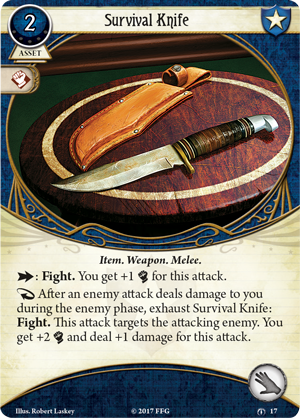 As you pack your bags, we encourage you to examine the campaign log (pdf, 5.6 MB) and get to know your travel companions with the investigator sample deckbuilds. Prepare yourself to forge a new path and experience the adventure of a lifetime! Pick up your copy of The Forgotten Age (AHC19) at your local retailer today or on the Fantasy Flight Games website here!